Home › Christian › Could Jesus Really Return at Any Moment? Could Jesus Really Return at Any Moment? For those who are unaware, Jesus was supposed to have come back a couple of days ago. You didn’t know? Well, don’t feel bad, I didn’t either. I prefaced the above so that you may know that I do not subscribe to date setting in relation to the return of Jesus. However, I do acknowledge that we can know the season. That is scriptural. “What’s your point?” You may be asking. The other day I began reading the book of Matthew. Normally, when beginning with Chapter 1, I make it a point to skip all the “begats,” between verses one and seventeen. You know, this one begat that one who begat the other one and so on. I was skipping them again when I felt impressed to stop and take a closer look. What I found made me do a double take. From verse 1 to verse 17, there are three sets of fourteen generations for a total of forty-two generations. These generational periods begin with Abraham and end with Jesus. From history, we know that around two thousand years passed between the time of Abraham and the time of Jesus. After doing some extremely complicated multiplication and division, which simply means I left my shoes on, I came to the conclusion that a generation, according to the Bible, is around 48 years. Why did I find that interesting? In Matthew 24:34, the Word tells us, in relation to the return of Jesus, “Truly I tell you, this generation will certainly not pass away until all these things have happened. The word for “this,” in the Greek is the word “houtos,” which can also mean these. Is it possible that verse 24 should read, “…these generations will certainly not pass away until all these things have happened?” If that is the case, and God is following the generational pattern of three sets of fourteen generations, then we are at the very tail end of that third set. As a matter of fact, starting at 1 A.D. to present, the last generation will “mathematically,” end around 2016 or 2017. Am I saying Jesus will return next year or the year after? NO! There are too many variables to make such a prediction. Besides, as I wrote above, date setting is ludicrous. What I am saying is that too many signs have been revealed in these last few months to ignore. Jesus will return. To that I have no doubt. I don’t know when, but I am very certain that it is soon. Be blessed! Agreed, not the day nor the hour but the season. Interesting and I agree. 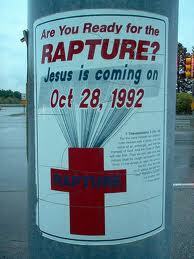 I can never figure out why people try to predict when Jesus said the He doesn’t even know the day or the hour. Also, the spiritual heart of that teaching is for believers to always being watching, ready, and living a godly live. Knowing the exact time would remove that spiritual value. It’s not important to know when but to be ready. Absolutely. Right now we are living in a time where signs are rampant, but that does not mean to go and date set. Me too…I didn’t wont to hurt those around me. You.speak the truth. Jesus told us to be aware and the Bible gives us signs. I too believe we are living in the “last days” but would never presume to put a specific date on when, nor believe anyone who did as the Bible also specifically says that not even the angels know, no one but The Father.